In a standing mixer or with a hand mixer, beat together flour, a pinch of salt, and parts of the water and knead for approx. 5 – 7 min. until a smooth dough forms. On a lightly floured surface, continue to knead dough by hand until smooth. Place into a bowl and cover with a clean kitchen towel. Set aside and allow to rest for approx. 30 – 40 min. In a small bowl, whisk eggs until well combined. In a small saucepan, heat parts of the vegetable oil over medium-high heat until hot. Add eggs to pan and scramble for approx. 3 – 5 min. until eggs are fluffy and broken down into small pieces. Transfer to a plate and set aside to cool down. Peel shrimp and roughly chop. Mince ginger and finely chop Chinese chives. In a large bowl, combine scrambled eggs, ginger, minced meat, soy sauce, sugar, glutamate, and salt. Add the remaining water and mix well to combine. Add shrimp and chives to the bowl. Add remaining vegetable oil and stir to combine. On a lightly floured work surface, knead the dough. Using a sharp knife, separate into 4 equally sized portions. Halve quarters and roll each portion into a small log. Cut each log into 8 walnut-sized pieces. Roll dough portions on a lightly floured surface to cover each side with flour. Then, using little pressure, flatten the dough pieces with the palm of your hand. With a small rolling pin, roll each piece into a circle in the size of a small hand palm. 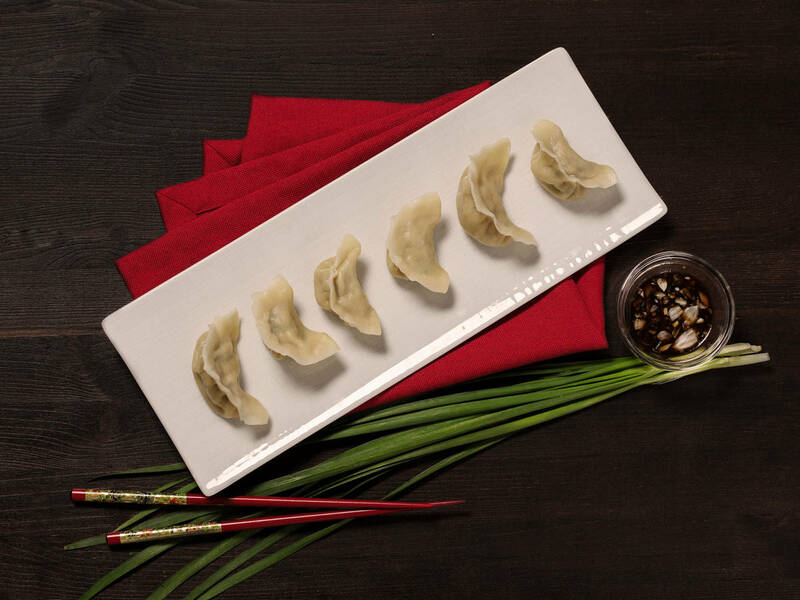 To avoid tearing, make sure that the center of the dumpling is slightly thicker. Place approx. 1 teaspoon of the filling in the center of each round. Fold over one side to form a half circle and press the center. Then, tightly seal the remaining edges while releasing any extra air. Make sure that all sides are closed firmly. Place dumplings on a plate lined with paper towel. Half-fill a large saucepan with water and bring to a boil. Then, gently, but quickly slide in approx. 1/3 of the dumplings. Using a cooking spoon, carefully stir the dumplings to avoid sticking. When the water returns to a boil, add one cup of cold water to lower the temperature. Return to a boil and then add more cold water. Repeat for two more times. Stir occasionally. When the fourth cup of cold water is added, immediately turn off the heat and remove dumplings from the pan using a skimmer. Place on a plate and allow to drain. Cook remaining dumplings. For the dip, place vinegar into a small bowl. Add sugar and stir to combine. Press garlic into the bowl and mix well. Dip hot dumplings into the sauce and enjoy!